1. Heat a large saucepan over a medium-high heat, add sliced chorizo and cook for 5 minutes, stirring occasionally, or until chorizo is golden and heated through. 2. 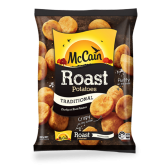 Remove McCain Traditional Roast Potatoes from oven and halve/quarter them according to size. 3. 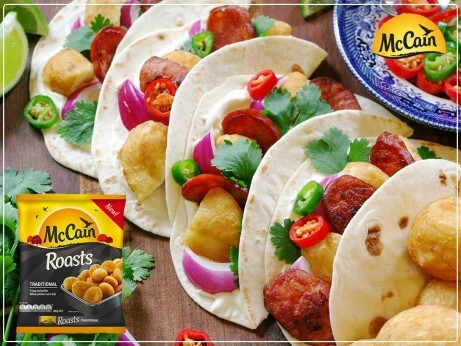 Serve McCain Traditional Roast Potatoes, chorizo, tortillas, onion, coriander, chilli, lime and sour cream immediately on a large chopping board and allow guests to build their own tacos. 1 Heat a large saucepan over a medium-high heat, add sliced chorizo and cook for 5 minutes, stirring occasionally, or until chorizo is golden and heated through. 2 Remove McCain Traditional Roast Potatoes from oven and halve/quarter them according to size. 3 Serve McCain Traditional Roast Potatoes, chorizo, tortillas, onion, coriander, chilli, lime and sour cream immediately on a large chopping board and allow guests to build their own tacos.